You are currently browsing the daily archive for January 28, 2010. Oscar nominations will be announced on February 2. We’re counting down to the big day by offering some hard-hitting analysis and incisive opinions on the toughest questions surrounding the nominees. All of us have our favorite films and performances currently on the bubble. And we all have spent long periods of time spewing invective at the films and performances that will keep our favorites out. What inclusion or exclusion on Tuesday will disappoint you? John: Out With The Old, In With The Old? On Tuesday, Invictus is likely to end up with nominations for Best Picture, Actor, and Supporting Actor. It’s not a bad movie and in fact has an irresistible spirit that partially overcomes some of its flaws. And Morgan Freeman and Matt Damon turn in fine performances, though they do not reach the level required for nominations in my humble opinion. But what disappoints me is how unimaginative these nominations will be. Invictus is an epitome of Oscar bait: schlocky, a plot that superficially tackles difficult social issues, and directed by Clint Eastwood. With an expanded slate of ten Best Picture nominations, if we’re going to have mediocre nominees let’s at least make them interesting and not just the same old stuff. The sort of narrow vision that rewards films like this year after year is tiresome. Plus the Freeman/Damon nomination combo will likely put the kibosh on Damon’s chances to be nominated for a much better performance in The Informant!, the performance of the year in fact. Freeman will slip into the fourth or fifth spot for Actor, denying Damon, while Damon’s own popularity in Supporting Actor for Invictus will erode his support for Lead. These perennial safety nominations are usually worth an eye-roll but now they’re actively undermining my own preferences! Gah! Like John, and its pretty scary to write those words, I saw a lot to enjoy in An Education, and a few things to nitpick on (too long, etc..), but my adoration of the film begins with Alfred Molina as Carey Mulligan’s father. His bombast was great comic relief and his scene later trying to comfort Mulligan is one of the best in the movie. Viewed in the modern context, his views on the roles of a wife/daughter were abhorrent enough that you couldn’t even see why his wife would have married him, but it is to Molina’s credit that they were played of as buffonery instead of malicious disrespect. While I hope (and deep down think) that he will get recognized for the role, I’m going for the reverse jinx here and saying that he will be ignored. And if the Academy had any cojones, they would take a page from the American Latino Media Awards and nominate him for his role in Pink Panther 2 as well. Jared: Would Like To Make It Perfectly Clear That He Has Nothing Against Mr. Eastwood And Means No Disrespect. About Anything. Ever. I’ve got a few gripes here, so I figure I’ll lay them all out and maybe I’ll get lucky and one will hit, like last year (with The Reader). In the Best Picture race, the one film that really is going to cheese me off is Invictus, exactly the opposite of the type of film the expansion is supposed to help, I think. Did anyone love this movie? If you want to like it, that’s fine, whatever. But just like Frost/Nixon, this film will be largely forgotten a year from now. Heck, I’d wager the movie is largely forgotten right now. It is just stunning to me that anyone who has seen at least a dozen movies this year could count the film as one of the year’s best. If a film like The Messenger gets in, I’ll be sad, but at least I can understand how it inspires reverence. With Invictus, I think people are confusing an inspiring story with a well-told one. For Best Actor, I’m increasingly realizing I’m alone here, but I think Daniel Day-Lewis is getting lost in shuffle, thanks to the mediocrity that is Nine. Well, and we also probably take him for granted at this point, since he keeps turning in larger than life performances over and over again. Putting the movie aside, Day-Lewis is mesmerizing as director Guido Contini as he balances all the women in his life with putting together a new movie. Any success the film has may well be directly attributed to him. (Well, OK, Judi Dench is pretty cool, and Penelope Cruz’s dance didn’t hurt.) The transformation Day-Lewis undergoes from role to role is just staggering. Finally, if you want to have a debate over how much “acting” goes into mimicking someone famous, that’s fine. But if you want Morgan Freeman and Meryl Streep to get nods, you have to want Christian McKay to get one as well, for playing the titular character in Me and Orson Welles (that would be Orson, not Me). It really is as simple as that, for me. His Welles is a whirlwind of a character, dominating his screen time, as any Welles should. And he left an impression every much as vivid as Freeman or Streep, if not moreso. This is actually a pretty easy category for me. My favorite film of the year was Inglourious Basterds and it will also easily cause the biggest disappointment for me. While last year’s snub of Dark Knight for Best Picture and the little love for In Bruges caused me anguish, this year I believe my front-runner will get the nominations it deserves. Unfortunately, this triumph will be bittersweet and tempered by the fact that it will not win for Picture, Director, or Writing (I hope, at this point, that Waltz is a lock for Supporting Actor – not sure if I will be able to continue to watch the Oscars if he doesn’t). While my love for all things Tarantino biases my opinion, I don’t think it can be denied that he writes one hell’va script. To the point that even Jason Reitman gave him props at the Golden Globes saying he was still waiting for Tarantino’s name to be called instead of his own. Since I won’t be able to be unbiased, I’ll leave my ranting there and forgo the reasons Picture and Director should go to him as well. Needless to say, the lack of a win in these categories will definitely be the biggest disappointment for me this year. I would enjoy being a member of the Academy. I would like getting to feel important and vote for things and have dozens of screeners arrive in the mail. Unless my life takes a drastic turn, this is unlikely to happen. Nomination ballots are in and the announcement is around the corner. What if I were a member of the animation branch? What would have been on my ballot, currently being tabulated by PriceWaterhouseCoopers? And why the animation branch? Because I was looking for categories I felt knowledgeable enough to comment on, that’s why. But why see so many animated movies? 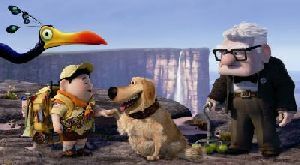 Animated films often have two elements I love in the movies: they create new worlds and they allow for a wide range of stylistic expression. Things that cannot exist do in animation, be they computer-generated, hand-drawn, or painstakingly sculpted. In a bad live-action film you only have the actors’ ugly mugs to look at. 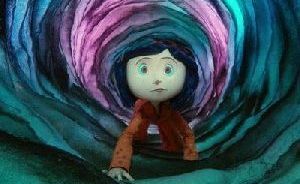 In a bad animated film at least you often have interesting visuals to carry you through. Unlike many other categories, Best Animated Feature nominees are not determined by ranked ballots. Instead, branch members making nominations are required to view, in theaters, 80% of eligible films. The voter gives each film a score of a whole number between 6-10, with 10 being excellent, 8 good, 7 fair, and 6 poor. Which is an interesting system since a 6 can run the gambit between mildly disliked to downright awful. Any film with an average over 7.5 is eligible to be nominated. The top three receive nominations (or, like this year, the top 5 if 16 films qualified). It’s pretty impossible for a regular joe to actually see 80% of the animated films since many barely got a qualifying release. Some were even straight-to-DVD releases their distributors stuck in theaters for a week to qualify and increase the chances of five nominations this year. But I have seen half and that’s pretty good. It’s hard not to call this an excellent film. It has so much heart and earned emotion. Most people remember the terrific and heartbreaking opening sequence, but they forget how genuinely, laugh-out-loud funny it is too. It is beautifully animated and backed with wonderful characters. A major misfire for me. Instead of fun or clever or funny it’s just smugly quirky and completely listless. 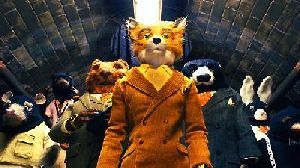 Wes Anderson is so wrapped up in his own style that he doesn’t tell a compelling story. Even the stop-motion animation is wasted by not providing much in the way of fun visuals. This is really a beautiful film. I think I’ve given anime short shrift if this is how it usually looks. The narrative elements of the film are all over the place, with plot elements coming unexplained out of nowhere and immediately forgotten, and the voice acting sounds like teachers reading a book to students: slow and overly animated. I understand it’s probably a stylistic choice but it drove me nuts. But it’s gorgeous, imaginative, and adorable with some terrific music. Everyone’s going to want their own Ponyo. I really enjoyed the look and style to this film and appreciated its dark edge and unique premise (at least for animated films). I just wish the story didn’t play out so unoriginally. The action sequences are entirely by-the-number and there’s no sort of development to any character’s motivations- I felt like I had walked into a film already in progress. But the second half is a significant improvement and its dark turns provide a fun ride. An Australian claymation film telling the story of a lonely Australian girl and her middle-aged penpal with Aspberger’s in New York. 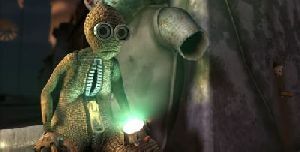 I loved its visual style, from the smooth claymation to the sparse use of color. The story deals with some surprisingly dark themes but without ever losing its humor. A very unique film. No 2009 animated feature had a more distinctive style. Its bright colors and playful disregard for perspective are quite entertaining, which is good because the story left me utterly baffled. 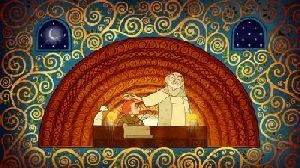 I believe it’s based on an Irish legend about the creation of the Book of Kells, but I’m familiar with neither the legend nor the book so the whole thing was confusing. I loved the Celtic music too. With a better story this would have been a real winner. This is pretty much an animated horror film for kids and it really is seriously creepy, especially some parts at the end. It’s imaginative and lovely to look at. I wish the plot points were as intriguing as the premise, however, as the story – especially the climax – plays out routinely, albeit with a nice helping of creepiness. Not bad, but not recommendable, hence the score. DreamWorks did terrific work both visually and narratively for Kung Fu Panda so it was a little disappointing to see it fall back on run-of-the-mill kiddie action for this one. 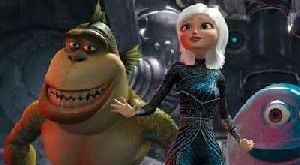 It has a few hilarious jokes and the monster characters are pretty amusing, but this one is pretty forgettable as a film and as animation. I’m happy to see Disney return to old-fashioned hand-drawn animation. There’s really no inherent benefit to computer animation, it’s just a stylistic choice. Plus this Disney animation is a nice American tradition it would be a shame to lose; in fact this is the only hand-drawn film eligible this year. I enjoyed its very colorful palette, amusing characters, and some of the songs, though I did find the story a little blah. The plot and theme are a little all over the place, like it can’t decide on just one direction and it tries to pack too many lessons. 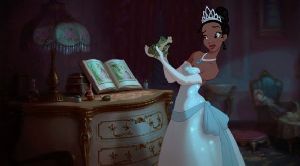 Disney could have gone for another routine computer-animated yarn about forest animals, but instead took a chance on a hand-drawn fairy tale set in 1920s New Orleans starring black characters. A very nice return to tradition. This is, by far, the funniest of the animated films I saw. There are dozens of very funny jokes. But the animation is nothing special and the plot unfolds unimaginatively, including several uninspired action sequences. I wish the sort of talent that went into writing the jokes could have been applied to any of other elements of the film. 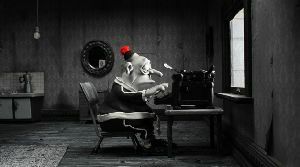 Intriguing Belgian Gumby-style claymation film A Town Called Panic. Computer-generated forgettables Astro Boy, Planet 51 and Battle for Terra, as well as computer-generated forgettable blockbuster Ice Age 3. The latest motion capture film from Robert Zemeckis, Disney’s A Christmas Carol. The depressingly-successful Alvin and the Chipmunks: The Squeakquel. Straight-to-DVD until Disney put it in a theater to push the number of eligible films and therefore the number of nominees, Tinkerbell and the Lost Treasure. And two foreign computer-generated imports: the Peruvian The Dolphin: Story of a Dreamer and Spanish The Missing Lynx (produced by Antonio Banderas). I know the former was picked up by Fox to bolster the number of eligible films but I’m not sure how the latter got distribution. Unless it’s seriously entering the competition and not a cynical ploy to help a major studio. As if!